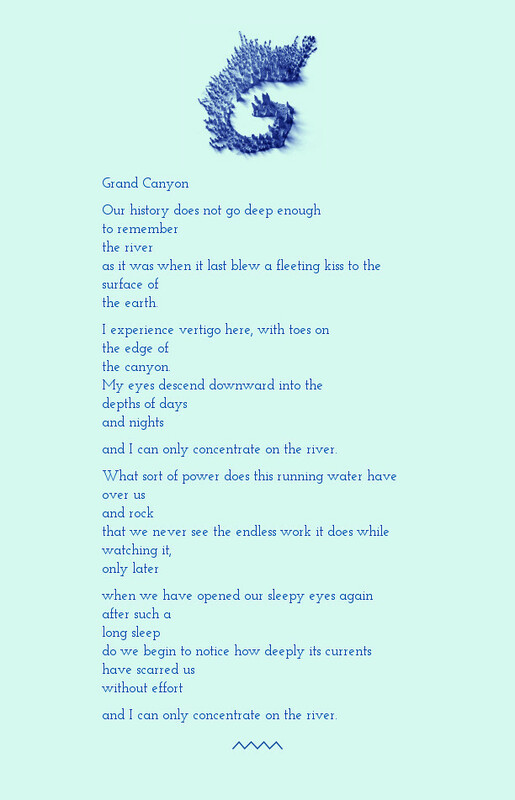 Today’s Wonder poem is about the Grand Canyon. I found myself thinking of the water more than the rock with this one. We’re starting our planning for this summer’s Making Learning Connected Massive Open Online Collaboration (notice how we don’t say “course” — that’s important) or CLMOOC. We’re in a very soft launch mode right now, but you can visit the FAQ page and add your email to our update lists. Basically, it will be a summer of play and exploration and learning, all under the umbrella of Innovator Educator‘s Summer to Make, Play and Connect. We had great success, and a blast, last summer and we’re working to build on that experience for Round Two. 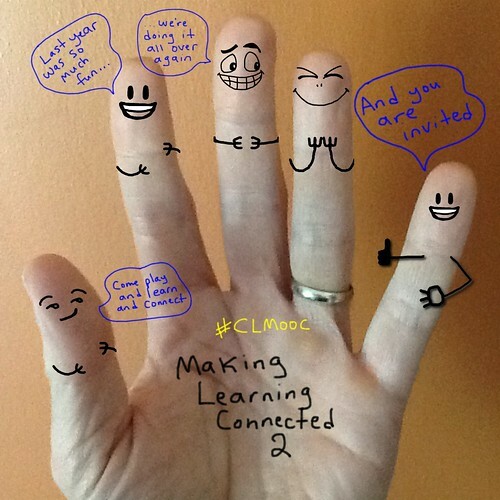 Making Learning Connected runs from June 13-August 1, 2014 and we use the Twitter hashtag #clmooc. This is an amazing resource about Web Literacy ideas. Click on a skill and see a pathway forward towards new skills that connect back to the original inquiry. (nicely done, Laura Hilliger and other folks at Mozilla). Plus, the whole resource is remixable, so you could revise it for your own audience and purpose. these ghosts are now natures painters. these ghosts are now nature’s painters. Today, we play our annual Quidditch Championship between the four sixth grade classrooms. 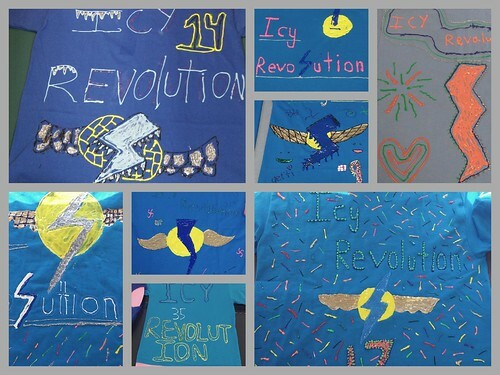 I don’t know if my homeroom team — Icy Revolution — will win or not, but I do know that the day is going to be crazy, hectic fun. And loud. Real loud. Today’s Wonder Poem is about Petra, or the Rose City of Jordan. Here’s another Wonder of the World that I knew very little about until Mary Lee put it on the list for poetry. I decided to write my poem in an open source writing platform called TitanPad. It’s sort of like Google Docs, in that you can collaborate, but I like how it creates a “timeline” of revisions, which I then captured as a short video of the writing of the poem. I can say there were no dramatic revisions here, just a bit of moving around words and fixing syntax. So the timeline-effect is not as dramatic as it could be. I hosted it up at YouTube. dug deep into mountains to remake it? were lost in the mountain to reshape it? praying deep into the night to save it? seeking for the right to take it? It really is true: there’s nothing new here. Not with Twitter. Not with Facebook. Not with blogging. Not with any of the social media that we keep saying has “upended” traditional media. In this fascinating look at social media over the past 2,000 years, Tom Standage digs deep into our historical roots to show how the flow of information along social lines has been one constant thread through various phases of civilization. Writing On the Wall is a fascinating read (and I heard about it from a book review column a friend of mine does at the Boston Globe, where her focus was books about social networking), starting off with Cicero in Rome, asking friends and allies to make sure they sent news of politics and government via notes, complete with comments, delivered by friends, and then moves into the use of pamphlets and scrolls and the printing press and more communication systems from the past that eerily echo the present. And all of the same arguments back when Plato was railing against written text (as inferior to oral tradition), and when the Church was railing against Martin Luther and the Reformation Movement, and when the elites in the Arab world were worried about coffeehouse gatherings, and when the King of England was railing against Thomas Paine, and … well, it goes on and on, this railing against the power to publish being put into “the wrong hands” and what information might do to us. Sure, some of what gets published in any space is lies, distortions and more, but when the flow if open and moving, a reader has a better chance of judging veracity and weighing the impact of information, and good will prevail. Today’s topic for the Wonders of the World poem is the Panama Canal. I had this vision of lovers on either sides of a lock. I sort of went into an ee cummings mode here. You can view the poem in a prettier form at Notegraphy, too. And a podcast. It felt right that I needed voice to this one. Do you agree? The Delta Works sounds like a band out of Memphis, doesn’t it? But it’s really a complex engineering system to hold back the ocean in the Netherlands, and as I read about for this morning’s Wonder of the World (with Mary Lee), I had this vision of a shape poem in my head. I had shared Coggle out with some folks last week, and so I decided to dive back into the mindmapping site and create a flowchart poem of the Delta Works.